For other uses, see Bomber (disambiguation). A bomber is a combat aircraft designed to attack ground and naval targets by dropping air-to-ground weaponry (such as bombs), firing torpedoes and bullets, or deploying air-launched cruise missiles. 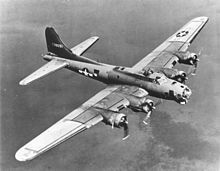 Strategic bombing is done by heavy bombers primarily designed for long-range bombing missions against strategic targets such as supply bases, bridges, factories, shipyards, and cities themselves, to diminish the enemy's ability to wage war by limiting access to resources through crippling infrastructure or reducing industrial output. Current examples include the strategic nuclear-armed bombers: B-2 Spirit, B-52 Stratofortress, Tupolev Tu-95 'Bear', and Tupolev Tu-22M 'Backfire'; historically notable examples are the: Gotha G.IV, Avro Lancaster, Heinkel He 111, Junkers Ju 88, Boeing B-17 Flying Fortress, Consolidated B-24 Liberator, Boeing B-29 Superfortress, and Tupolev Tu-16 'Badger'. Tactical bombing, aimed at countering enemy military activity and in supporting offensive operations, is typically assigned to smaller aircraft operating at shorter ranges, typically near the troops on the ground or against enemy shipping. This role is filled by tactical bomber class, which crosses and blurs with various other aircraft categories: light bombers, medium bombers, dive bombers, interdictors, fighter-bombers, attack aircraft, multirole combat aircraft, and others. Historical examples: Ilyushin Il-2 Shturmovik, Junkers Ju 87 Stuka, Republic P-47 Thunderbolt, Hawker Typhoon and Mikoyan MiG-27. The first use of an air-dropped bomb (actually four hand grenades specially manufactured by the Italian naval arsenal) was carried out by Italian Second Lieutenant Giulio Gavotti on 1 November 1911 during the Italo-Turkish war in Libya. although his plane was not designed for the task of bombing, and his improvised attack on Ottoman positions at Ainzzarra had little impact. These picric acid-filled steel spheres were nicknamed "ballerinas" from the fluttering fabric ribbons attached. In 1912, during the First Balkan War, Bulgarian Air Force pilot Christo Toprakchiev suggested the use of aircraft to drop "bombs" (called grenades in the Bulgarian army at this time) on Turkish positions. Captain Simeon Petrov developed the idea and created several prototypes by adapting different types of grenades and increasing their payload. On 16 October 1912, observer Prodan Tarakchiev dropped two of those bombs on the Turkish railway station of Karağaç (near the besieged Edirne) from an Albatros F.2 aircraft piloted by Radul Milkov, for the first time in this campaign. This is deemed to be the first use of an aircraft as a bomber. The first heavier-than-air aircraft purposely designed for bombing were the Italian Caproni Ca 30 and British Bristol T.B.8, both of 1913. The Bristol T.B.8 was an early British single engined biplane built by the Bristol Aeroplane Company. They were fitted with a prismatic Bombsight in the front cockpit and a cylindrical bomb carrier in the lower forward fuselage capable of carrying twelve 10 lb (4.5 kg) bombs, which could be dropped singly or as a salvo as required. The aircraft was purchased for use both by the Royal Naval Air Service and the Royal Flying Corps (RFC), and three T.B.8s, that were being displayed in Paris during December 1913 fitted with bombing equipment, were sent to France following the outbreak of war. Under the command of Charles Rumney Samson, a bombing attack on German gun batteries at Middelkerke, Belgium was executed on 25 November 1914. The dirigible, or airship, was developed in the early 20th century. Early airships were prone to disaster, but slowly the airship became more dependable, with a more rigid structure and stronger skin. Prior to the outbreak of war, Zeppelins, a larger and more streamlined form of airship designed by German Count Ferdinand von Zeppelin, were outfitted to carry bombs to attack targets at long range. These were the first long range, strategic bombers. Although the German air arm was strong, with a total of 123 airships by the end of the war, they were vulnerable to attack and engine failure, as well as navigational issues. German airships inflicted little damage on all 51 raids, with 557 Britons killed and 1,358 injured. The German Navy lost 53 of its 73 airships, and the German Army lost 26 of its 50 ships. Caproni Ca.3, an Italian World War I heavy bomber, 1915. The Caproni Ca 30 was built by Gianni Caproni in Italy. It was a twin-boom biplane with three 67 kW (80 hp) Gnome rotary engines and first flew in October 1914. Test flights revealed power to be insufficient and the engine layout unworkable, and Caproni soon adopted a more conventional approach installing three 81 kW (110 hp) Fiat A.10s. The improved design was bought by the Italian Army and it was delivered in quantity from August 1915. While mainly used as a trainer, Avro 504s were also briefly used as bombers at the start of the First World War by the Royal Naval Air Service (RNAS) when they were used for raids on the German airship sheds. The Sikorsky Ilya Muromets, an early strategic heavy bomber. Bombing raids and interdiction operations were mainly carried out by French and British forces during the War as the German air arm was forced to concentrate its resources on a defensive strategy. Notably, bombing campaigns formed a part of the British offensive at the Battle of Neuve Chapelle in 1915, with Royal Flying Corps squadrons attacking German railway stations in an attempt to hinder the logistical supply of the German army. The early, improvised attempts at bombing that characterized the early part of the war slowly gave way to a more organized and systematic approach to strategic and tactical bombing, pioneered by various air power strategists of the Entente, especially Major Hugh Trenchard; he was the first to advocate that there should be "... sustained [strategic bombing] attacks with a view to interrupting the enemy's railway communications ... in conjunction with the main operations of the Allied Armies." When the war started, bombing was very crude (hand-held bombs were thrown over the side) yet by the end of the war long-range bombers equipped with complex mechanical bombing computers were being built, designed to carry large loads to destroy enemy industrial targets. The most important bombers used in World War I were the French Breguet 14, British de Havilland DH-4, German Albatros C.III and Russian Sikorsky Ilya Muromets. The Russian Sikorsky Ilya Muromets, was the first four-engine bomber to equip a dedicated strategic bombing unit during World War I. This heavy bomber was unrivaled in the early stages of the war, as the Central Powers had no comparable aircraft until much later. Long range bombing raids were carried out at night by multi-engine biplanes such as the Gotha G.IV (whose name was synonymous with all multi-engine German bombers) and later the Handley Page Type O; the majority of bombing was done by single-engined biplanes with one or two crew members flying short distances to attack enemy lines and immediate hinterland. As the effectiveness of a bomber was dependent on the weight and accuracy of its bomb load, ever larger bombers were developed starting in World War I, while considerable money was spent developing suitable bombsights. A RAF Avro Lancaster with a 22,000-pound (10,000 kg) Grand Slam bomb, 1945.
dive bomber — specially strengthened for vertical diving attacks for greater accuracy. light bomber, medium bomber and heavy bomber — subjective definitions based on size. torpedo bomber — specialized aircraft armed with torpedoes. ground attack aircraft — aircraft used against targets on a battlefield such as troop or tank concentrations. night bomber — specially equipped to operate at night when opposing defences are limited. maritime patrol — long range bombers that were used against enemy shipping, particularly submarines. Bombers are not intended to attack other aircraft although most were fitted with defensive weapons. World War II saw the beginning of the widespread use of high speed bombers which dispensed with defensive weapons to be able to attain higher speed, such as with the de Havilland Mosquito, a philosophy that continued with many Cold War bombers. Some smaller designs have been used as the basis for night fighters, and a number of fighters, such as the Hawker Hurricane were used as ground attack aircraft, replacing earlier conventional light bombers that proved unable to defend themselves while carrying a useful bomb load. At the start of the Cold War, bombers were the only means of carrying nuclear weapons to enemy targets, and had the role of deterrence. With the advent of guided air-to-air missiles, bombers needed to avoid interception. High-speed and high-altitude flying became a means of evading detection and attack. Designs such as the English Electric Canberra could fly faster or higher than contemporary fighters. When surface-to-air missiles became capable of hitting high-flying bombers, bombers were flown at low altitudes to evade radar detection and interception. Once "stand off" nuclear weapon designs were developed, bombers did not need to pass over the target to make an attack; they could fire and turn away to escape the blast. Nuclear strike aircraft were generally finished in bare metal or anti-flash white to minimize absorption of thermal radiation from the flash of a nuclear explosion. 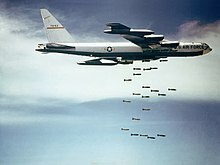 The need to drop conventional bombs remained in conflicts with non-nuclear powers, such as the Vietnam War or Malayan Emergency. A USAF B-52F over the North Vietnam. The development of large strategic bombers stagnated in the later part of the Cold War because of spiraling costs and the development of the Intercontinental ballistic missile (ICBM) – which was felt to have similar deterrent value while being impossible to intercept. Because of this, the United States Air Force XB-70 Valkyrie program was cancelled in the early 1960s; the later B-1B Lancer and B-2 Spirit aircraft entered service only after protracted political and development problems. Their high cost meant that few were built and the 1950s-designed B-52s are projected to remain in use until the 2040s. Similarly, the Soviet Union used the intermediate-range Tu-22M 'Backfire'in the 1970s, but their Mach 3 bomber project stalled. The Mach 2 Tu-160 'Blackjack' was built only in tiny numbers, leaving the 1950s Tupolev Tu-16 and Tu-95 'Bear' heavy bombers to continue being used into the 21st century. 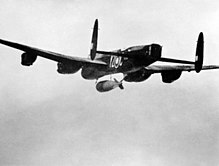 The British strategic bombing force largely came to an end when the V bomber force was phased out; the last of which left service in 1983. The French Mirage IV bomber version was retired in 1996, although the Mirage 2000N and the Rafale have taken on this role. The only other nation that fields strategic bombing forces is China, which has a number of Xian H-6s. A USAF B-1B over the Pacific Ocean. At present, the U.S. and Russia are involved in developing replacements for their legacy bomber fleets, the USAF with the Northrop Grumman B-21 and the Russian Air Force with the PAK DA. A 1999 USAF report calls for the US bomber fleet to remain in service until the late 2030s-early 2040s, and the B-21 is scheduled to reach deployment in the 2020s. The U.S. is also considering another bomber in 2037. The B-21, however, required to provide an answer to the fifth generation defense systems (such as SA-21 Growlers, bistatic radar and active electronically scanned array radar). Also, it has been chosen to be able to stand against rising superpowers and other countries with semi-advanced military capability. Finally, a third reason is the role of long-term air support for areas with a low threat level (Iraq, Afghanistan), the latter referred to as close air support for the global war on terror (CAS for GWOT). The B-21 would thus be able to stay for extended periods on a same location (called persistence). Occasionally, military aircraft have been used to bomb ice jams with limited success as part of an effort to clear them. ^ Johnston, Alan (10 May 2011). "Libya 1911: How an Italian pilot began the air war era". BBC News. Retrieved 2011-05-23. ^ Stephenson, Charles. A Box of Sand. The Italo-Ottoman War 1911-12. p. 107. ISBN 978-0-9576892-2-0. ^ "The Balkan Wars: Scenes from the Front Lines". TIME. 8 October 2012. Retrieved 28 July 2015. ^ a b Mark (July 1995). Aerial Interdiction: Air Power and the Land Battle in Three American Wars. pp. 9–10. ISBN 978-0-7881-1966-8. ^ Mason, Francis K (1994). The British Bomber since 1914. London: Putnam Aeronautical Books. ISBN 0-85177-861-5. ^ Taylor, Michael J. H. (1989). Jane's Encyclopedia of Aviation. London: Studio Editions. p. 204. ^ Thetford, Owen (1994). British Naval Aircraft since 1912 (Fourth ed.). London: Putnam. ISBN 0-85177-861-5. ^ Roadman, LTC Julian A. (2013). A Combat Nightmare in WWII. Triumph Press. pp. 11–12. ISBN 9781484911846. ^ Shalal, Andrea (February 26, 2016). "New Northrop bomber to be designated B-21 -U.S. Air Force". yahoo.com. Reuters. Retrieved April 16, 2017. ^ Smith, Stephen H. (January 19, 2018). "York's Past: Aerial bombing breaks Susquehanna ice jams". The York Daily Record. Retrieved 2018-07-19. ^ Daniszewski, John (2001-05-18). "Russian Planes Bomb Ice Jam". Los Angeles Times. ISSN 0458-3035. Retrieved 2018-07-19. ^ Sridharan, Vasudevan (2016-04-19). "Russian fighter jets bomb 40km ice-jam to prevent flooding in Vologda". International Business Times UK. Retrieved 2018-07-19. Look up bomber in Wiktionary, the free dictionary. Wikimedia Commons has media related to Bomber aircraft.